The Aquila Italiana was an Italian automobile manufactured from 1906 to 1917. 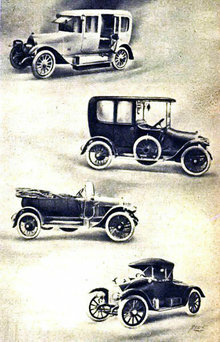 Designed by Giulio Cesare Cappa, the cars were big four- and six-cylinder models with ioe engines of an advanced type. There was an interruption in construction after 1908, but the company introduced new models in 1911; these featured 4192cc six-cylinder engines and proved to be successful in many races. Among Aquila Italiana drivers were Meo Constantini (later to join Bugatti at Molsheim, where he became first a racing driver and later the Chef d'Equipe) and Carlo Masetti (count Giulio Masetti's elder brother). Aquila (its full name was 'Società Anonima Aquila Italiana') was started by Giulio Parravicini and Cesare Cappa in 1906 at Turin. 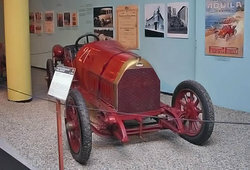 Cappa, a young engineer, was already studying overhead valves and aluminium pistons, and when their first car appeared at the Turin Motorshow in 1906 it included many advanced features. 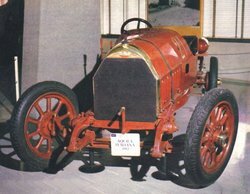 Despite receiving a good reception, the sudden death of Parravicini in 1907 (before they had built a single production car) threw the company into financial problems. These were only resolved when in 1909 when one of the banks which had put the company into receivership paid off all their debts and gave the company a new chance. The son of the owner of the bank, a certain Giovanni Marsaglia, was interested in cars, as well as being a racing driver, and became involved with the company. The company Aquila Italiana produced a total of approximately 1,500 copies of its cars, all models combined.